Vlad was one of the artists-in-residence at the New Harmony Clay Project. During his time in New Harmony, he worked with high fire sculpture work as well as experimented with local low-fire clay. He explored new modes in contemporary ceramics as process-driven endeavors, and engaged the transformative qualities of clay that form a communication with metaphorical, metaphysical, political, cultural and experimental undertones. Basarab also made work for the exhibition Together Apart during the National Council on Education for the Ceramic Arts (NCECA) and hosted by the Pittsburgh Cultural Trust between March 13-18, 2018. Together Apart ponderd the made and unmade, focusing in particular on the shard, something that was once whole and is now partial. How many years have you been working as a clay artist? I have been working in clay for over 30 years. What is your main clay body that you currently use? I do not have a main clay body. In the past years, in Romania I have used terracotta clay that I dug up, while in China I have used stoneware and porcelain bodies that I combined. What is the primary method you use for building your work? I use a thick paper clay slip that I trowel on top of canvases that I spread over unsealed concrete floors or tables. Once the clay is no longer like a paste, I manipulate it to build sculptures with it. What is your favorite studio tool? I don’t necessarily have a favorite tool. It used to be the wheel for a lot of my functional work and sculpture. I guess, the trowel and the knife are my favorite. Do you have any future clay wishes or dreams? I would like to build large scale monumental work, murals, outdoor sculptures fired on site and landart-type ephemeral works. Vlad Basarab brings to the attention of the 21st century public the human need to safe guard the past. He tries to compel the audience to reflect upon the implications of memory loss and to inspire people to symbolically dig through the layers of history like an archaeologist in order to recover altered, hidden or lost history and writings. By referencing historic attempts at cultural effacement that were motivated by political, ideological, and religious concerns, he attempts to create a sense of nostalgia and loss that the viewer might feel. 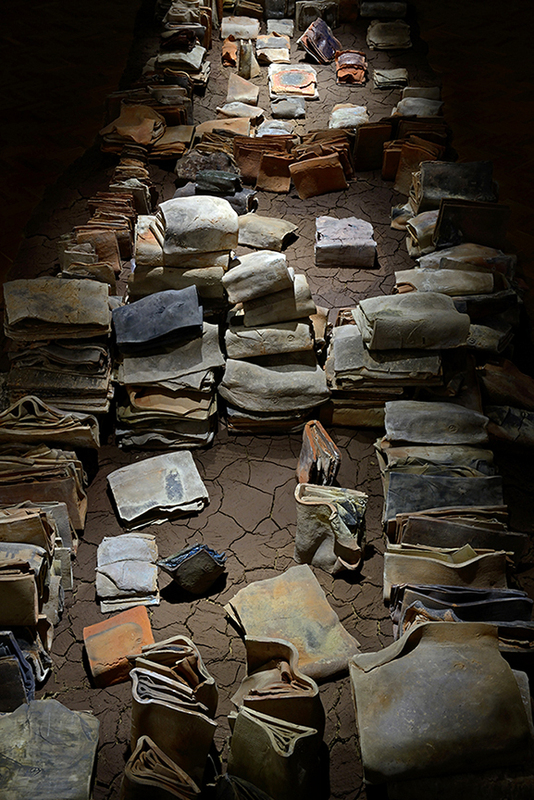 In his installations and videos, he has used unfired and fired clay books. 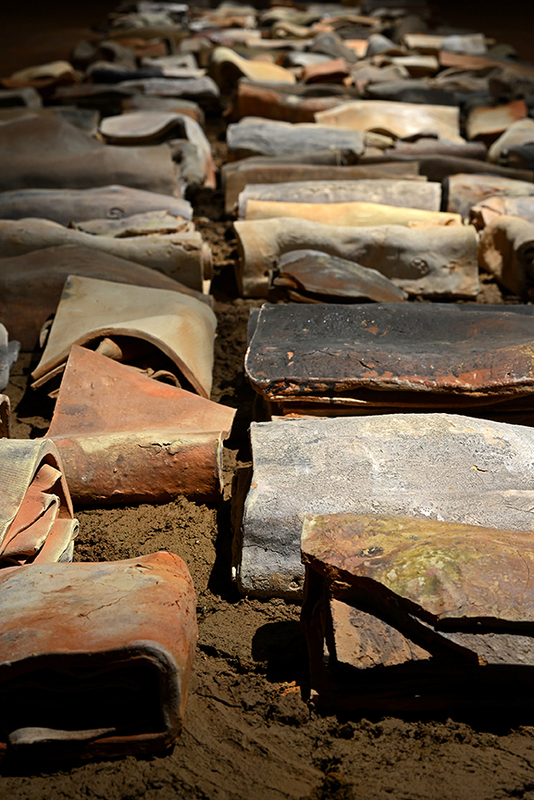 The unfired clay books reference the fragility of knowledge and of the human condition, while the fired books become a symbol of permanence, a vehicle for transmitting knowledge. 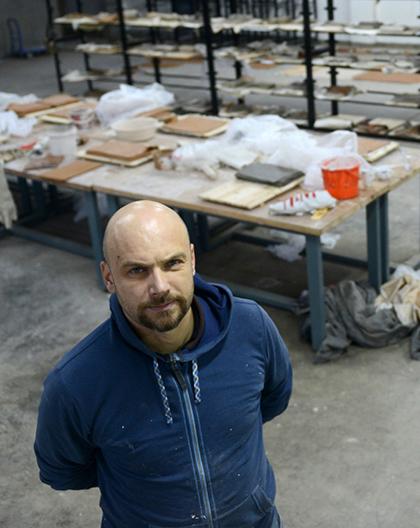 Vlad Basarab is an artist working with ceramics, installation, video and performance. He is a member of the IAC International Academy of Ceramics of UNESCO, Geneva, Switzerland, member of the Union of Artists of Romania, and a member of NCECA (The National Council on Education for the Ceramic Arts), USA, of the Galateea Contemporary Art Gallery Group, Bucharest, Romania. He recently won the Award of Excellence at 2017 Cluj International Ceramics Biennale (7 member international jury, Cluj Museum of Art, Romania). Basarab is a doctoral candidate at the University of Art in Bucharest with the working thesis Exercises of Recovering Collective Memory through Monumental Art and Multi-media Interventions in the Public Space. He received a Fulbright research grant to Romania with the theme Art as a Form of Remembering and Mourning the Victims of Cultural Censorship (2013-2014); 1st prize for the international competition for the Monument dedicated to the Romanian Language in Chișinău, Republic of Moldova (2014); Masters of Fine Arts Degree in Electronic Media from West Virginia University (2013); Bachelors of Fine Arts Degree in Ceramics, University of Alaska Anchorage (2001); President of non-profit organization Basarab Art & Science and Director of non-profit organization COMBINART 1+1= 10, Romania, In 2016, Basarab curated Coast to Coast, An exhibition of North-American Ceramics Artists at Brancoveanu Palace, Mogoșoaia, Romania. In 2017, he was a guest of honour of the European Comission Representation to Romania, European Union Pavilion at the Gaudeamus Book Fair, Bucharest, Romania. Basarab has had 21 solo shows, from which the most important are: in 2017: Gaudeamus Book Fair, Bucharest; Libris Book Fair, Brașov, Romania; 2016: Galateea Contemporary Art, National Library of Romania, Bucharest, National Art Museum of Moldova, Chisinau, The Museum of Art, Arad, Romania; 2015 – 2016, Brukenthal National Contemporary Art Museum, Sibiu, Romania; 2015: Pittsburgh Center for the Arts, Romanian Cultural Institute, New York; 2013: Paul Mesaros Gallery, Creative Arts Center, West Virginia University, Morgantown; in 2008: Simeza Gallery, Bucharest; in 2007: Mountain View Arts Center, Anchorage; 2001: Kimura Gallery, University of Alaska, Anchorage, Galeria GALLA, Bucharest, Romania. 2017: Exhibition of international artists from the collection of Jingdezhen Ceramics University, International Studio at Ji Zhou Kiln, Ji An, Jiangxi, China; SUPORT, Galeria Turnătoria, Bucharest, Romania; The IV-th International Cultural Exchange Romania-Korea, Boryeong Si Museum, South Korea; Jingpiao – Jingdezhen A City in Dialogue with the World, Jingdezhen China Ceramics Museum; Cluj International Ceramics Biennale (Excellence Prize), Cluj Art Museum, Romania; Macsabal International Woodfired Ceramics Symposium Exhibition, Zibo Ceramics Fair, Shandong, China; Gyeonggi International Ceramic Biennale 2017 (Honorory mention), Icheon World Ceramic Center, Gyeonggi-do, Republic of Korea; The 4th "Hong Guang Zi Qi" International Ceramic Art Festival, Kai Hong Tang Art Museum, Yixing, China; Incandescent Metaphors, Arcade 24, Bistrița Năsăud and Art Nuveau, Târgu Mureș, Romania; 2016: The Mode-International Ceramics Art invitational Exhibition in LiLing Ceramics Valley Museum, China; 2015: NCECA International Biennial, Providence, Rhode Island; European International Book Art in Bucharest, Romania; Facets of Hyperconnectivity, The Brancoveanu Palace, Mogosoaia, Romania; Rhythm Repetition Ritual (Best of Show), Pottery Northwest, Seattle, Washington; Invisible Cities: Art as a Political Sublety in Central/ Eastern Europe, University of Wisconsin, Madison; Re-animation II, The Brancoveanu Palace, Mogosoaia; 2014: Re-animation I, Bucharest International Print Biennial; British Flute Society Convention; NEURON, Galeria IX, Bucharest, Romania; Exchange / 2014 Berlin Fulbright Grantee Juried Exhibition, Staycation Museum, Germany; Romanian Atheneum, Bucharest; 2013: The International Ceramics Biennale, Cluj, Romania; Earth Moves: Shifts in Ceramic Art and Design, Arvada, Colorado; Fifth International Artists' Book Exhibition at the King St. Stephen Museum, Székesfehérvár, Hungary; 2012: Project Spaces, National Council of Education on the Ceramics Art, Seattle, Washington; Decorative Arts Biennial, Bucharest; Outdoor Sculpture Exhibition at Kentuck Knob, Pennsylvania. In 2018, as part of NCECA concurrent exhibitions, Basarab will organize Together/Apart at the Pittsburgh Cultural Trust and will curate ClayVoiceRomania at City of Asylum in Pittsburgh, USA. In 2016, he curated Coast to Coast, An invitational exhibition of North-American Ceramicists, at The Bracoveanu Palace Cultural Center, Mogosoaia/Bucharest, Romania, as well as took part in the curatorial team of Arts in Bucharest, Bucharest, Romania. Basarab had many public lectures: 2017: Guest of Honour of the European Comission at the Gaudeamus Book Fair, Romania; The Pottery Workshop, Jingdezhen, China; International School of Jingdezhen Ceramics University, Jingdezhen, China; Jingpiao – Jingdezhen, A City in Dialogue with the World, Jingdezhen Ceramics University; International Ceramics Association, Yixing, China; in 2016: Nanjing University Ceramics Department, Nanjing, China; Museum of Art Arad, Romania; in 2015: Habitus, Sibiu, Romania; Romanian Cultural Institute New York; Pittsburgh Center for the Arts, Pittsburgh, Pennsylvania; in 2014: Cross Cultural Encounters, Traumatic Affect and Paths of Remembrance, National University of Bucharest, American Studies in Romania; American Corners, National Library of Romania, Bucharest; The University of Fine Arts, Iasi, Romania; in 2013: Rethinking Intermediality in the Digital Age/ Conference of the International Society for Intermedial Studies at Sapientia Hungarian University of Transylvania, Cluj, Romania; Cluj International Ceramics Bienniale, Museum of Art, Cluj Napoca, Romania; University of Alaska Anchorage, Fine Arts Building; University of Missouri Kansas City; in 2007: University of Alaska Anchorage, Fine Arts Building. Artron Art Group, China; Museum of Art, Cluj-Napoca, Romania; Toyaseum, Korea Ceramics Foundation, Icheon World Ceramic Center, Gyeonggi-do, Korea; Yixing Museum, Yixing, China; Taishuan Ceramics Factory Co Ltd, Zibo, Shandong, China; Kayfull Hotel, Yixing, China; Liling Ceramics Valley Museum, Hunan, China; Jingdezhen Asia Europe America Ceramics and Glass Center, Jingdezhen, China; Libris, Brașov, Romania; Senso TV, Bucharest, Romania; Arad Art Museum, Romania; West Virginia University, Health Science Center, Morgantown, West Virginia; Academy of Sciences, Chisinau, Republic of Moldova; Municipality of Belvi, Sardegna, Italy; Arvada Center for the Arts and Humanities, Arvada, Colorado, USA; King St. Stephen Museum, Székesfehérvár, Hungary; Creative Arts Center, West Virginia University, Morgantown, West Virginia, USA; Orthodox Monastery of the Transfiguration, Ellwood City, Pennsylvania, USA; Saint Andrew the Apostle Romanian Orthodox Church, Pittsburgh, Pennsylvania, USA; St. Mary's Romanian Orthodox Cathedral, Cleveland, Ohio, USA; Dormition of the Mother of God Orthodox Monastery, Rives Junction, Michigan, USA; The Ascension of the Lord Romanian Orthodox Monastery, Clinton, Michigan, USA.